Think for a moment about how crazy it is that Apple first released the AirPods last December, six months ago, and it still hasn’t figured out how to manufacture them quickly enough to meet demand. After all this time, new orders on Apple’s website still take 6 weeks to be delivered. That’s just nuts. You can order them with two-day Prime shipping on Amazon, but you’ll have to pay a premium for the privilege. There’s nothing wrong with that if you really want them, however we’ve got another option for you to consider. The SMARTOMI Q5 True Wireless Earbuds are cord-free just like Apple’s AirPods, and they have an impressive 4.5-star rating on Amazon. They also cost $39 compared to $159 or more for AirPods, which is a huge difference. Did we say $39? Use coupon code XA2Y9TQB and you’ll only pay $23.39 while supplies last! 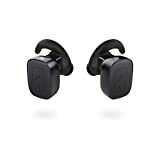 ✔ COMPLETELY WIRELESS EARBUDS DESIGN − This is the true cordless headphones of cheaper price than similar ones that free you from the disturbance of cord. Secure fit and no worry about earbuds falling out during workout, fitness, exercise, running or sports. ✔ BEST VOICE QUALITY (Clearer Phone Calls） − 8mm built-in microphone enables you to make a clear call as though you are holding the phone. Hands-free switching mode, silent mode, last number redialed, third-way calling and caller voice prompt that satisfy all your needs at a time! ✔ SUPERIOR CONNECTION STABIITY −The wireless bluetooth headphones meet your need for stereo sound under the dual mode. Bluetooth 4.1 offer hyperstable connection and rid of troubles of sounds dropping out frequently within 10m/33 feet.Compatible with all bluetooth enable devices such as iPhones 7/7plus, 6/6s plus,SE,5/5s, Samsung, smartphones and tablets. ✔ SNAP PARING & ONE-KEY DESIGN − Easy use with one-key to pair, answer/reject calls and play/pause music. Enjoy great convenience as the true wireless headphones will be auto-connected back to devices and musics will be auto-replayed after hanging up. Press the LEFT earbud for 4s to activate Siri. Low battery alert & IOS battery indicator are also sweet! ✔ SEPARATELY USE OR SHARE − Sharing music with the one you love, using them separately upon your needs or 1 connected to 2 devices(Only for single earbud) NOTE: We offer 45-DAYS NO REASON TO REFUND and 1-YEAR WARRANTY for Smartomi bluetooth in ear earphones. More preferential promotion also set up for the new release.ADD TO CART NOW!